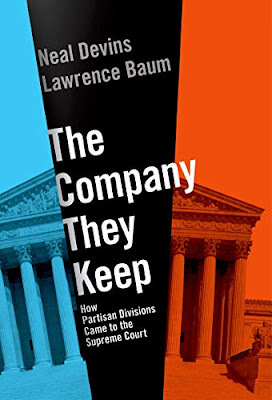 This week at Balkinization we are hosting a symposium on Neal Devins and Lawrence Baum's new book, The Company They Keep: How Partisan Divisions Came to the Supreme Court (Oxford University Press, 2019). We have assembled a terrific group of commentators, including Mark Graber (Maryland), Linda Greenhouse (Yale), Rick Hasen (U.C. Irvine), Sandy Levinson (Texas), Frank Pasquale (Maryland), Rick Pildes (NYU), John McGinnis (Northwestern), and myself. At the conclusion, Neal and Larry will respond to the commentators.